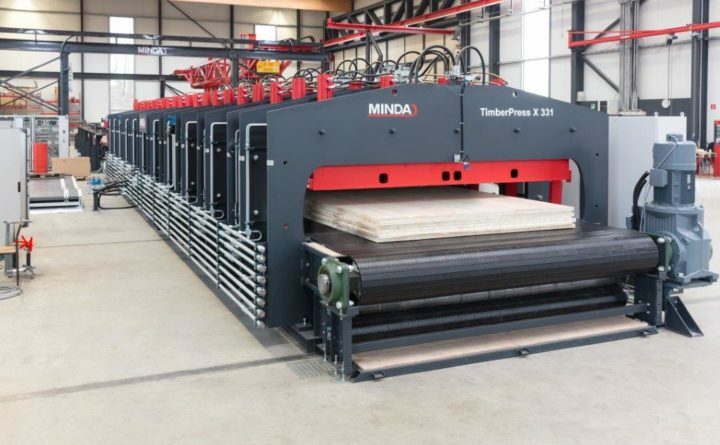 Some version of this cross-laminated timber press at SmartLam, the Montana-based first manufacturer of the composite wood product in the United States, will likely be built on a site the company selects within Maine. That selection will be announced in two months, company officials said. 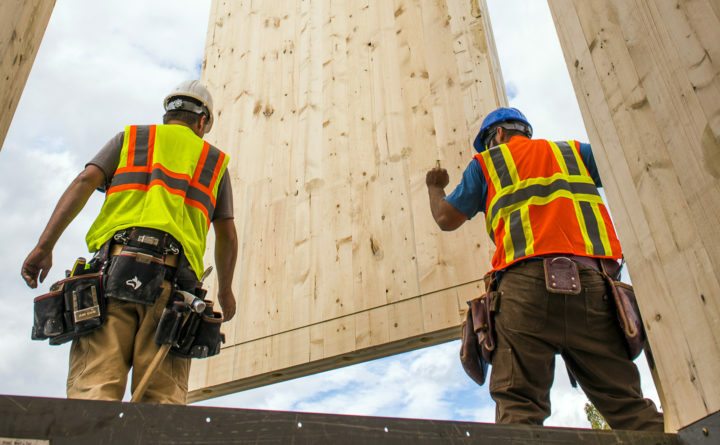 Workers from SmartLam, the first manufacturer of cross-laminated timber (CLT) in the United States, move a piece of CLT into place on a construction site. SmartLam, LLC of Montana still seeks a mill site, but has committed to building a factory in Maine within 18 months. Founded in 2012, the company produces more than 1 million board feet of the engineered wood product per month and employs 40 people in Montana’s Flathead Valley, SmartLam President Casey Malmquist said. SmartLam is the second maker of cross-laminated timber, a composite wood strong enough to replace steel and concrete in some types of high-rise buildings, to announce Maine expansion plans this week. LignaTerra Global LLC of Charlotte, North Carolina announced plans at Husson University on Tuesday to build a $30 million, 300,000-square-foot factory to produce CLT in Millinocket. The company hopes to break ground in July and start production in 12 months with more than 100 workers. Gov. Paul LePage made unnamed reference to SmartLam in his State of the State address earlier this week and tweeted a specific mention of the company on Thursday. “Great news for our forest products industry #mepolitics,” LePage said. The state-funded Maine Technology Institute awarded SmartLam a $3 million grant to help it launch its second factory, said Brian Whitney, president of MTI. The grant was announced Thursday. SmartLam workers will likely earn wages enough to support families, said Ashley Pringle, vice president of operations at Maine & Company, a nonprofit business development agency that helped bring SmartLam to Maine. Its workers will need skills that include quality control, engineering, 3D modeling, computer-aided programming, design-, and manufacturing. The company will also hire salespeople and administrative staff, Pringle said. SmartLam has a four-year relationship with the University of Maine that will help it find new applications of CLT and develop a workforce capable of using it, Malmquist said. “We are seeing considerable demand for CLT on the East Coast as architects, builders and developers seek durable, sustainable building materials,” Malmquist said in a statement released on Friday. The Maine facility will give SmartLam “the perfect vantage point to supply customers,” Malmquist said — less environmental impact and lower shipping costs. Proponents say that CLT is cheaper to buy, easier to build with and leaves a smaller carbon footprint than steel and concrete. Its factories aren’t expected to create as many jobs as did paper mills, but it could absorb a great deal of the softwoods Maine’s mills used to create pulp. Former mill sites in Bucksport, East Millinocket, Lincoln, Millinocket and Old Town are among those possibly vying for SmartLam. Maine sawmills will supply wood to LignaTerra and SmartLam. LignaTerra said it chose the Millinocket site, home to Great Northern Paper Co. for more than a century, because it had excellent access to hydroelectric dams on the Penobscot River and rail access to Boston and Canada. It adjoins the Golden Road, the longest private road in the U.S., which is used primary by logging crews between Millinocket and New Brunswick. SmartLam’s decision to expand comes four months after it announced plans to open a new headquarters in its Montana hometown, Columbia Falls. It hopes to announce its Maine location in two months, Pringle said.